In order to ensure a homogeneous moisture level, it is crucial that the Organic-Lock blended aggregate be pre-hydrated prior to installation. 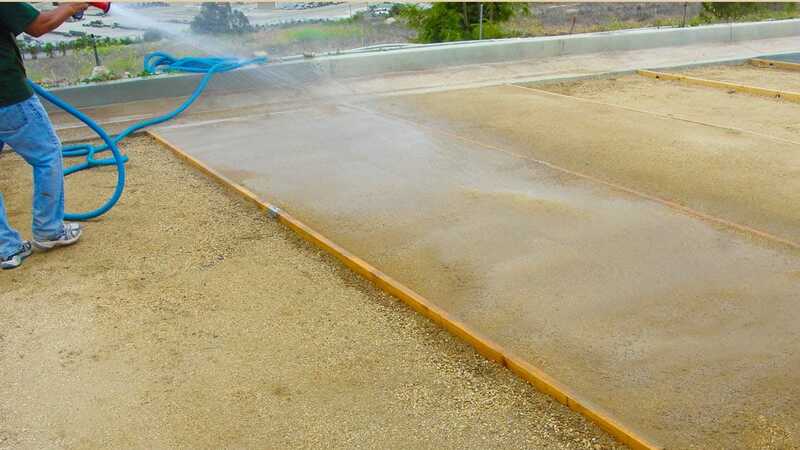 Attempting to spread the material dry and then surface spray with water may not hydrate the aggregate thoroughly or may excessively hydrate the top surface, resulting in a less optimal stabilized surface. A one-ton roller (for example, a Wacker Neuson RD 27) is ideal for compaction of Organic-Lock blended aggregate. Heavier rollers risk pushing the aggregate aside. Two-ton rollers have been used on select projects, however these need to be operated very slowly in order to avoid the “waves” that can be produced on the surface. A formwork aid (for example, a two-by-six wood formwork) is useful in providing a very clean edge for Organic-Lock blended aggregate surfaces and helpful for grade control as the blended aggregate can be leveled to the top of the formwork. The formwork should be set approximately 1/2″ above the desired grade to allow for the compaction of the material and should be removed as soon as possible as having the formwork higher than the blended aggregate will prevent water from draining off the surface. Good movement of water off and away from the blended aggregate is essential. Ensure that cross slopes of 1.5% – 2% are used, even when running slopes exceed these numbers. Avoid low spots where water gathers near the blended aggregate and ensure lawn edges are micro-graded so they are lower than the pathway to prevent water being trapped at the edge of the pathway. Unless a contractor is very familiar with the installation of Organic-Lock, it is helpful to have an experienced representative on call or on site for the first few installations to consult on the ideal Organic-Lock/aggregate mix for a particular project, moisture content before compaction and repair techniques. As with any aggregate surface, erosion from heavy rain can occur anywhere water gets channeled. In addition to ensuring proper water drainage design, in the event of very heavy rain damage, it can be helpful to periodically smooth damaged areas and redistribute the blended aggregate using a broom or brush. In very wet weather the path can become soft, but not muddy, underfoot. The natural operation of the Organic-Lock binder ensures that the plant glue activates in wet conditions to hold the aggregate particles together and in place. It will firm up again as it dries. As with any aggregate surface, avoid shoveling directly on the surface itself as you risk removing a top layer of loose aggregate in the process. Half-pipe PVC baffles or lifts attached to plow blades are useful to prevent gouging of the blended aggregate. In order to avoid slippery conditions which may result from the thin layer of snow left behind by this process, we recommend spreading a light layer of the original blended aggregate mix to use as winter grit, which ensures that the pathway will retain its original color and consistency when the snow and ice thaw. Salting is not recommended as the salt thaws the upper layers of blended aggregate while the lower remains frozen, resulting in soft conditions. Feel free to contact us any time with questions and a member of our experience team will get in touch.